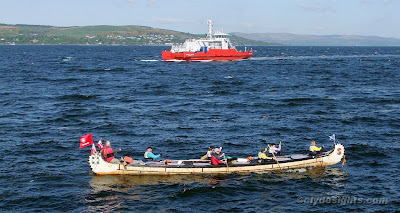 Passing Hunter's Quay on Tuesday afternoon was a small craft of a type not usually seen on the Clyde, a 42-foot long Canadian canoe. SPIRIT DANCER is currently making a voyage around the British Isles, and she set off from Glasgow on Monday 6th May. After spending Monday night at the Holy Loch Marine, SPIRIT DANCER was heading on her way under the leadership of Chris Cooper, a professional guide and explorer originally from Yorkshire. Cooper hopes that young Scots will take the opportunity to join him on board to learn about team work, the environment, history and culture. An excellent website describes the expedition and the craft herself.